Learning How to Dance in the Rain ....: Happy Days !!! Well its been a while since my last post - the days seem to have rolled by quite quickly. I am pleased to say that so far I am not suffering from the same side effects as last time - what a relief! Up to date the awful rash and welts that appeared last time have not arrived on the scene this time - phew!!! I did have to visit the GP this week for a sore throat but am now on antibiotics just incase!! 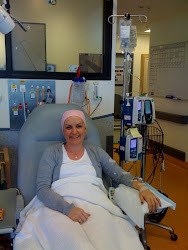 So it is just over a week until I have my final chemo - I can't wait!! It is a very happy household here at the moment as my mum arrived from overseas this weekend! We haven't seen here for over a year - so the girls are loving waking up and having Nanny in the house. First they have had Granny and Grandpa and now Nanny - it is such a blessing for them to have the extra support with all thats going on! So mum will come with me for my final chemo and then we still have 5 weeks of radiation and continued Herceptin and hormones to go! She is still pretty jetlagged from the flight etc so we are just laying low while the girls are at school - they have all sorts of plans in mind hehe!! Well the fun on the farm continues as we had inherited 2 goats from a couple who had rescued them from being made into something eadable!! 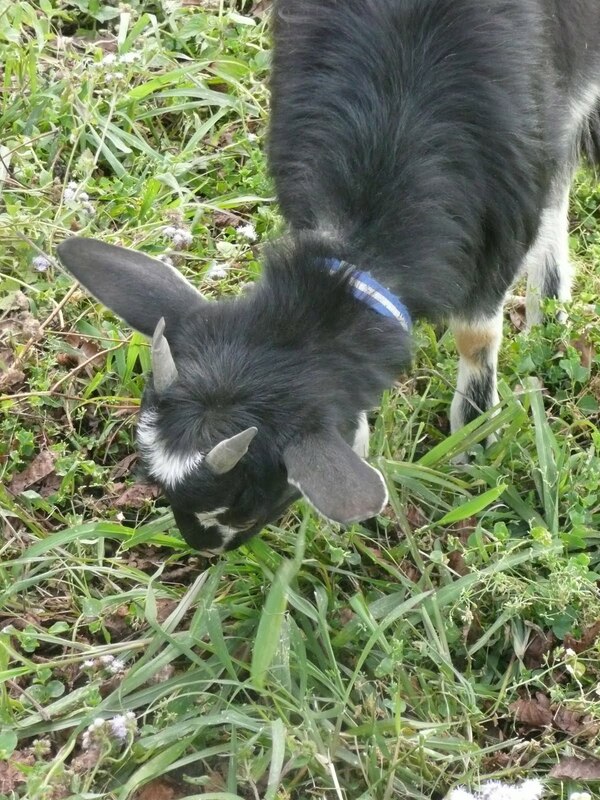 The couple had to return overseas and the goats had no where to go - so we took them on. This was just before all the shennaigans started with me . We have an enclosure where they are and we had been letting them out regularily etc but obviously with all my treatment and B exam etc - the goats have not been let out as much. 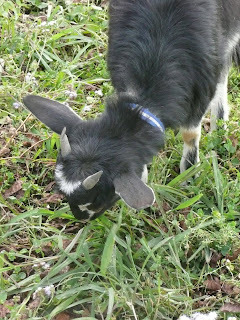 We can't let them wander all over the farm alone as they would just walk through the fencing and our biggest concern is that the people across the way would wake up next morning to find their nursery plants had been a buffet for the goats!! Anyway this long story is leading to say that B has been working away building them a new larger enclosure where they can jump about etc securily!! 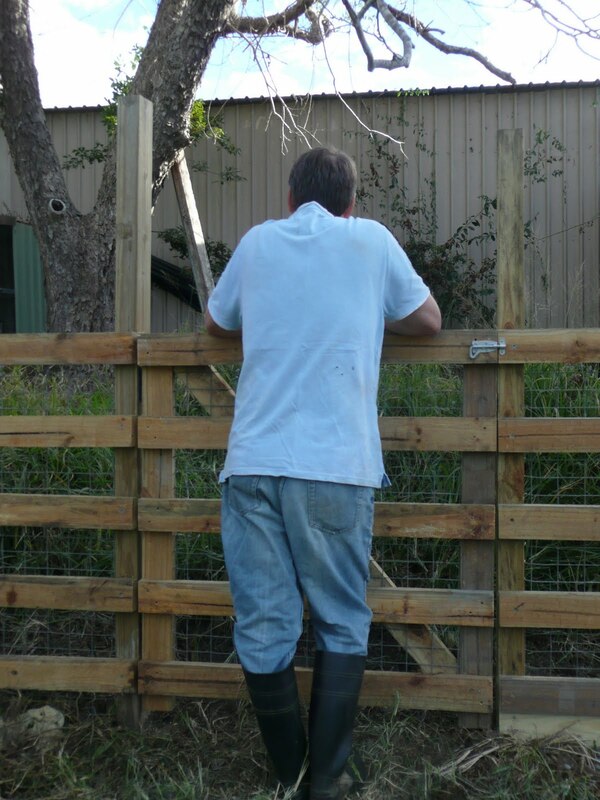 He has been labouring endlessly by himself building new fencing , an enclosure etc and finally all came together! We all went to watch the relocation of the goats , Missy and T2 - the names they had come with!! Goats are pretty clever I have to say and these 2 are just like dogs - they follow you everywhere and hate it when you leave them. Given half a chance they would be in the house I'm sure!! Well they went into their new spot no problems - they skipped and jumped around - investigated the tree! We oohed and aahed at B's handiwork - with a cheer and applause. 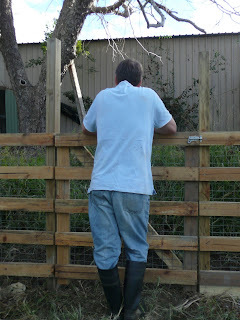 The fencing was quite high and B had made a gate from scratch!! He had worked so hard to get it all done. We turned to go and have a cuppa when T2 the larger of the two took a running leap and scaled over the top!! Well you should have seen my poor husbands face - I so felt for him - all that work in and T2 had escaped! I did everything I could to hold in my giggles as it was quite comical to watch!! Well we got her back in again - and sure enough it didnt take her long for a repeat performance. Not to be defeated B got some more wire and completely encased the new pen - we had hoped not to block it all up but didn't want to take any chances! I am pleased to report that they are still secure and seem very happy and settled in their new spot!! It also looks like Gemma the goose is sitting on some eggs - so we are really hoping all goes well and we see some goslings soon !! Will keep you posted!! 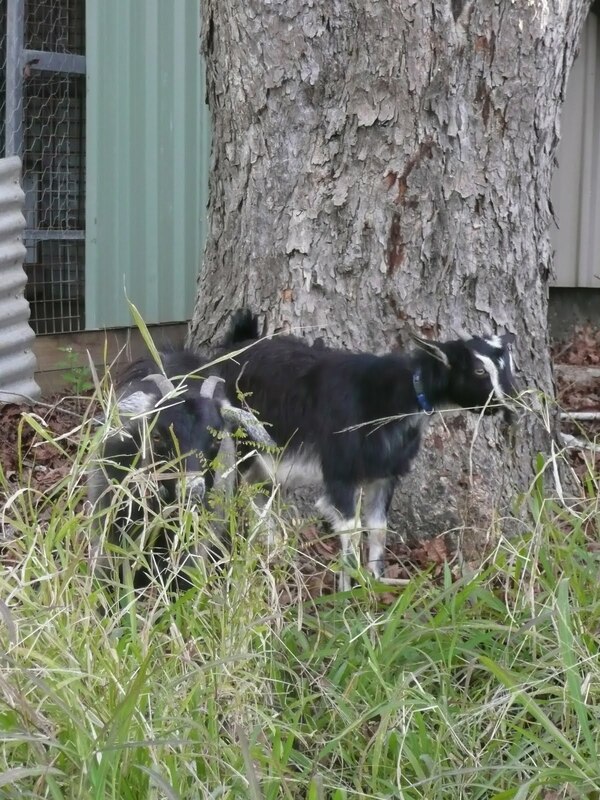 Well Deb's , This blog made me laugh when I read about goat jumping over Brian's fence . ha ha . I guess there is a lot to learn about animals as well as people :)) . So glad Mum has arrived and I am sure she is thrilled to be there with you all and can walk with you as you continue on with your treatment . So thankful to The Lord for standing by you at this time , truly He is a faithful friend . I do miss you all and am praying that someday soon I also can be with you all at " Pilgrims Rest " refresh centre . Love to all . Dad XXXXXXXXXXXXXXXXOOOOOOOOOOOOOOOO p.s. animals included . What a laugh - so glad Debs that you have not suffered the same after this lot of chemo dreadful stuff kills you to save you well that's what Keith often said to me! One day he just looked at me when I wasn't too well and said "Wish it had been me I would have coped better" I new what he meant I dont do sickness and he just wanted to make it all better for me. How blessed we are Debs to have such wonderful husbands. Laura Jane off on honeymoon in Rome we get a daily text to say they are having a lovely time.